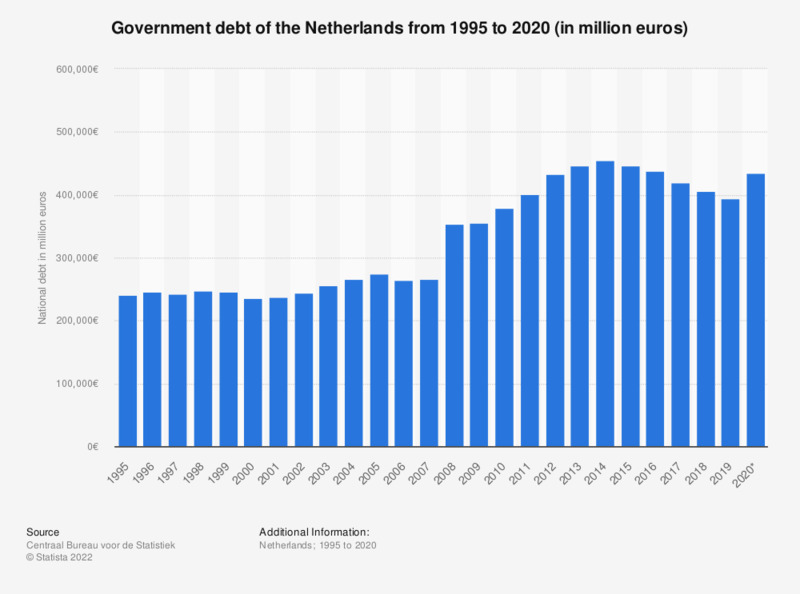 This statistic displays the general government debt of the Netherlands from 2008 to 2018 (in million euros). It reveals that between 2008 and 2014, the general government debt increased from approximately 266 billion euros to 456 billion euros, before decreasing again to roughly 405 billion euros in 2018. At the same time, the government debt as share of GDP also increased, according to this statistic. Whereas in 2008, the general government debt in the Netherlands was 55 percent, by 2014 this had increased to nearly 68 percent. 2014 saw the highest government debt in the period surveyed, but the then ruling government coalition VVD and PvdA took care to reduce the government debt after 2014. As this statistic shows, they were relatively successful in doing so, as between 2014 and 2018 the government debt decreased from nearly 68 percent of GDP to just over 52 percent of GDP. The consolidated national debt excludes the accrued debt, the financial derivatives debt and debts between governments and is measured against the nominal value. * The figures for 2017 and 2018 are provisional.